Happy 4th of July! It's hard to believe July is already here. In a month from now, it will be my first day of school! I have so much to do, and I can't stop thinking about school and all I have to do! I have a few projects out of the way that I wanted to finish, but my to-do list is LONG! 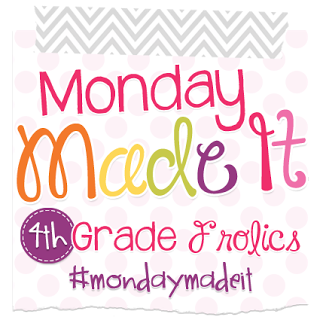 Today I am sharing my project and linking up with Tara from 4th Grade Frolics for one of my favorite linkys, Monday Made It! At my school, we are blessed to have parents who love to donate to our classrooms. I am constantly asked what supplies are needed. Last year I knew I wanted to keep my supply wish list up all year. In past years, I only set out a display at back to school night. My Wish List Selfies Set 1 was a hit with the parents and the students. I was able to easily switch out the supply cards we needed most. Of course this summer I decided to change my classroom colors from aqua, green, pink, and orange brights to primary brights. 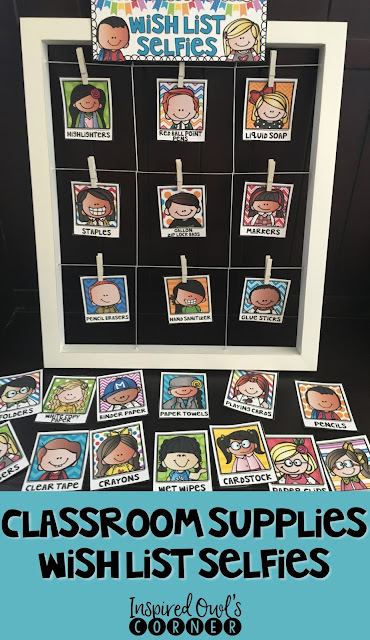 Everything in my classroom, including this, is getting a makeover! My aqua Selfies frame above is sitting in my classroom right now, so I used the white one to display my new set. You can see more of the file here. I have a freebie thank you note set from the file that you can grab here. I had a MMI #2 that my daughter helped me with, but it didn't quite work out the way we wanted. SO I'm hoping to share it next week once we get it perfected! I love the idea of a Wish List selfies. 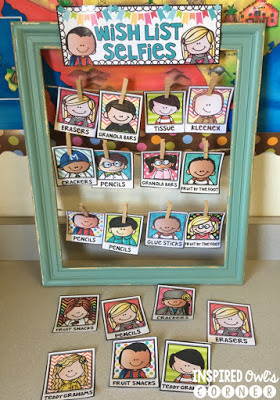 This is definitely cuter than the post-it notes I stick up on the board. Thank you for sharing! 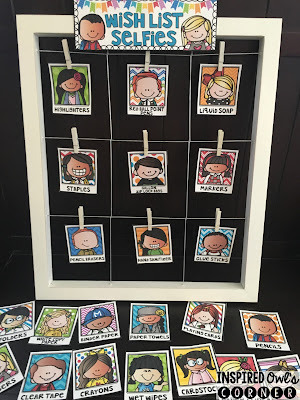 I have always adored your selfie supply board:) Your energy to redo your colors....I thought about it and that's about as far as it got:/ Don't have the time or energy this year....maybe next year:) Thanks for linking up friend!!! That Wish List Selfie board is SUPER CUTE! I've done the whole Cupcake Theme with "If you're feeling sweet please take a treat..." I might have to switch it up this year thanks to your wonderful idea! What a cute (and practical) idea! I love your wish list selfie idea.too cute!